The Book Nook Inn is a quaint bed and breakfast that will allow you to take time away from home without ever leaving town. This view of the Book Nook Inn shows the fishing pond, which is fully stock with catfish. The new "North Tower" is seen on the right side of the photo. One of the many hidden treasures of Lumberton is a quaint bed and breakfast that serves travelers from across the globe yet remains unknown to many who pass by it each day. Book Nook Inn officially opened their doors for business at the beginning of July 2013, and has already played host to more 30 visitors from throughout the United States, Great Britain, Germany, France, Italy as well as a variety of other locals. Innkeepers David and Stacie Hearne have been planning their business and working on it for the past eight years. They began advertising online in 2012, initially offering two of the planned five rooms for travelers to enjoy. "I felt there was a need as there was nothing like this around this area," said Stacie Hearne. "So far it is working. This is exhausting work, but it is definitely worth it. Hopefully everything will fall into place." Literature and reading are the couple's biggest passion, which helped foster the growth of the Inn's library. Not only do Stacie and David love reading, but Stacie has developed a book review business and David has also authored several books. "We want this to be your experience, not ours. You don't need to pat our dog, eat Stacie's homemade granola, or talk to David about his latest book - just do whatever makes you happy," the couple states on the Book Nook Inn's website. Though there has been limited advertisement locally and most guests have come from outside the area, the Inn is helping bring tourism dollars to the area. The Inn attracts and caters to an eclectic customer base of worldly travelers. The grand home that houses the bed and breakfast is known in the community for its unique appearance. The home offers multiple levels of decks, rooms and hidden alcoves. "We have enjoyed everyone who has visited. They come as guests, but leave as friends." Currently there are three rooms available for weekend getaways or lodging for persons traveling for work and/ or pleasure. Construction of two other suites is slated to be complete by year end. The Inn also offers ample space for parties, meetings or other gatherings of up to 50 persons. A large dining room and a family room easily transforms into an elegant area that provides ample space for special events. "We recognized that there was also a need for an event center that doesn't cost someone thousands of dollars to rent," Stacie said. "Soon we will have our North Tower portion of our Inn completed, which will provide a three level tower that houses a penthouse suite, a second level preparation suite and a ground level event room that will accommodate 80 to 100 guests." 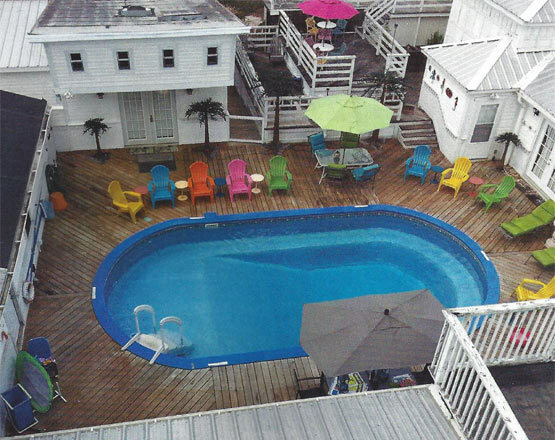 Cool off your stay, and take a dip in the Book Nook Inn's outdoor swimming pool. Amenities of the facility include a pool, hot tub, stocked fishing pond, movie room, library, exercise and game room, as well as homemade breakfast from only the finest ingredients, clean rooms and personalized service from the finest staff this side of the Neches River. "We have enjoyed everyone who has visited," Stacie said. "They come as guests but leave as friends." Detailed descriptions and photos of the available rooms, as well as rates per night, are available on the Book Nook Inn's website. 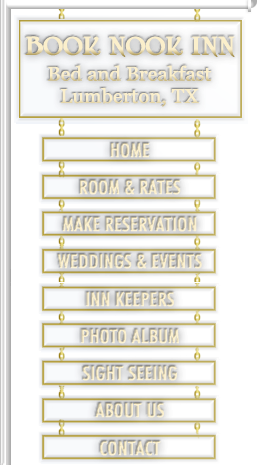 The Inn is located at 10405 Cooks Lake Rd., Lumberton. For additional information, call 409- 225-9106 or visit booknookinn.com. 2012 The Book Nook Inn opened to the public last year. 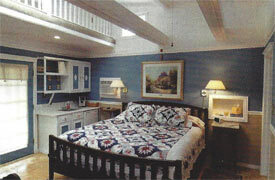 Three rooms are currently available for lodging at the Book Nook Inn. All rooms include en suite modern bathrooms, high-speed Wi-Fi internet and flatscreen TVs. Construction is being completed on the North Tower, a three level tower that will provide a penthouse suite, preparation suite, and ground level event room that will accommodate 80 to 100 guests. Construction completion is slated for the end of this year. Take a break from the Southeast Texas heat. Just steps from the Inn's outdoor pool is the "Pool Room" Suite. The Book Nook Inn is right on the edge of the Big Thicket National Preserve, where you can hike, bike, canoe, take tours and hunt during season. The Inn is also in close proximity to Lamar College, Delta Downs, Jefferson Theater and Julie Rogers Theater. Antique shops, museums and other historic sites in Texas' Golden Triangle are easily explorable from the Inn's location. If you prefer to lounge around the Inn, a movie room with vibrating seating is offered, as well as a large library and fishing pond stocked with catfish, perch and bass.